Junior Andy Jones has a busy summer, full of singing, coming up. Jones, who sings in the mixed choir and the pops choir at Paynesville Area High School, has been selected to the all-state choir by the Minnesota Music Educators Association (MMEA). Junior Andy Jones is the third PAHS choral student to be selected to the all-state choir in the past tow years. Andy, the son of Neal and Inez Jones, auditioned for the choir at St. Cloud State University on Saturday, March 24, and learned he had been chosen around April 20. Jones will sing second bass in the mixed choir at all-state. A year ago, Becca Gardner and Scott Ingalsbe, now PAHS seniors, were chosen to the all-state choirs. Gardner sang with the women's chorus, and Ingalsbe with the men's chorus. Gardner and Ingalsbe were the first PAHS students to earn a spot in the all-state choirs in nearly 35 years. Previous all-state choir members were Doug Olson in 1964 and Ron Olsen in 1965. Jones will attend a week-long camp at Gustavus Adolphus College in St. Peter, Minn., from Aug. 6-10. His choir will give a concert at the end of camp, and will perform at the MMEA conference in the Twin Cities next February. Jones auditioned for the all-state choir a year ago, but was not selected. His choir director, Cheryl Bungum, credits that auditioning experience with helping Jones this time. She felt his experience helped him relax at the audition, which includes a prepared solo, sight reading, and tonal memory testing. "I was really excited about it because I've had a hard time getting people to audition before," said Bungum of the nine who tried out this year. "But Becca and Scott coming back excited really helped. The experience of auditioning is worth it in itself." Hearing about their experiences helped Jones decide to reaudition. "It sounded like a good experience, and Scott and Becca spoke well of it and said I should do it," said Jones. "I really wanted to make it and I was glad I did," he added. Around 2,350 students audition from across the state for the all-state ensembles: band, choir, and orchestra. In all, 571 spots are available, including 248 in the three choirs. Taking just the state's elite, as these numbers show, indicate how tough it is for a sophomore to be selected, said Bungum. She hopes that this audition will help the sophomores a year from now. At camp, Jones will be surrounded by some of the best high school singers in the state. "When he gets down there," predicted Bungum, "he'll just have an awesome time because all the singers will be as excited as he is." 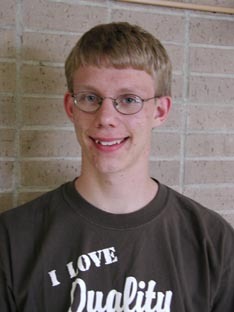 Directing the mixed choir will be Henry Leck of Butler University. Jones also sings in the contemporary Christian group, On Call, and will be going on a six-week tour to India this summer as well.